This November we have only received 46% of what would be considered normal rainfall. Since the earlier months were also drier than normal, thus far we have only received 33% of what would have been expected in the period July to November. The claims remain that El Niño will still rescue California and the west, but for the moment the drought continues . . . . The autumn has been so dry that the bounty wasn't enough to bring us back to normal. For the July to December period we are at 75% of normal. Still that's a huge improvement over the 33% of normal that was the situation for July to November. The big question remains whether El Niño will bring its bounty or not. We are expecting a wet first full week of 2016 - that's a start! We got over 1-1/2 times the normal rainfall for January and that was enough to bring to a scant 8% above normal for a period July-January. Alas, there is definitely a menacing forecast for the moment. Only nuisance rain expected this week and the NWS climate prediction center has mysteriously predicted below normal rainfall through mid-February. Since February is almost as wet as January, this could send the area back into drought territory in a hurry. Hopefully the forecast won't be correct, but it is enough to make me nervous . . . .
We received less than 23% of a normal February's rainfall at Canebas weather station. The overall numbers aren't horrible yet. 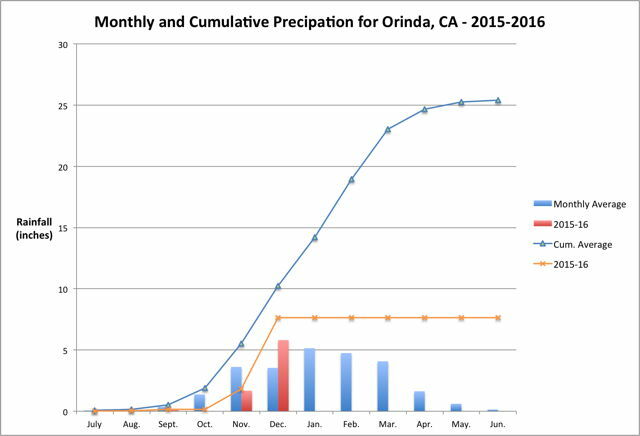 We are at 87% of a normal winter's rainfall to the end of February. With storms lining up in the Pacific to dump rain on the west starting this weekend, March is looking promising. Unfortunately, we definitely have some serious catching up to do. However, the news isn't as good as it appears. While we are within 2% of a normal rainfall year already, most of that rain fell in a very extreme period during the first 2 weeks of March. 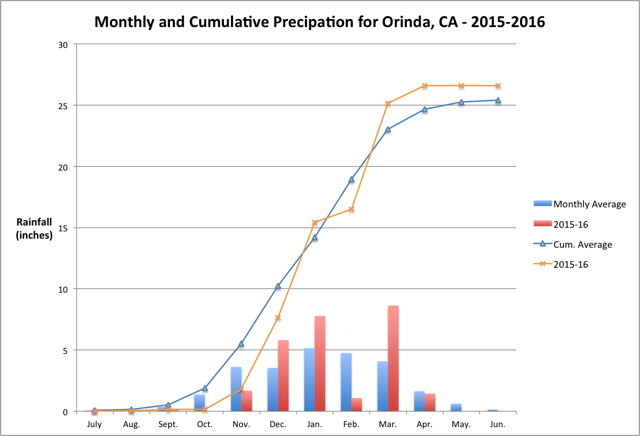 That rainfall did a lot of damage and most of that water was back in the Pacific within a very short period of time. During the second 1/2 of March there have been several periods of above normal temperatures that forced me to resume watering. 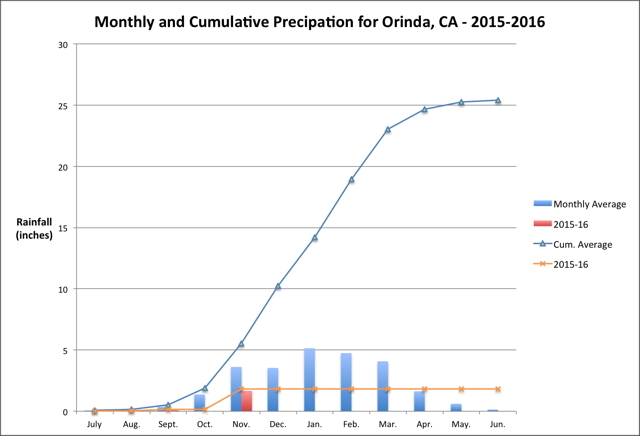 The rainy season isn't over yet, perhaps El Niño will provide a few more periods significant rainfall. What is clear is that California (and probably most of the western United States) aren't prepared to change their water collection strategies to take advantage of rainfall when it comes. Politicians are quick to take advantage of the short memories of the voters. Will the voters decide change is needed? Only time will tell. . . . . . Even if we get no more rain, we are 7% above normal at this point. At the moment there is at least one more rain event forecast for the next of next week. Alas, the quantity of rain is finally falling behind what the plants need. Unless we get a more substantial storm soon, we have made the transition into the dry season - which means it is watering season. Oh well, just one more chore I've gotta do . . . .
Rainfall in May was well below normal and June brought zero rainfall at all, so the dry season got off to hot and difficult start. We ended up with a few percent above a normal rainy season, but obviously that leaves the drought more or less where it was. Stay tuned for the 2016-17 season . . . . what does La Niña hold in store? . . . .